Answering one's own post, grr I hate that, but pondering on the matter in hand further it strikes me that...and I ain't no Feynman, that the two, the attempt at increasing altitude and the resulting drop in velocity (which produces orbital decay), would cancel each other out and you would not move at all. Boffins welcome to have a go! You have no idea of how much I treasure such no-nonsense questions as yours. I feel less alone when someone raises them. Its worth mentioning that the longest dimension of the "ISS" is it's width: 108.5 meters. Altair » November 4th, 2017, 2:33 pm wrote: if you have a look at a 747 flying at cruise altitude (about 12 km) you'll barely see any details, it's just a speck in the sky. Looking at it against the background of a bright blue sky, its pretty difficult to see - although its much easier if it passes at the correct angle to reflect a glint of sunlight to your eye. If the plane could fly high enough to be in sunlight when your sky is dark, it would be easy to see as a tiny sunlit speck against the completely black background of space. If it were bare metal instead of painted the speck would be a bit brighter. Altair » November 4th, 2017, 2:33 pm wrote: at... 400 km. Would it be so visible from the ground as the purported ISS? So it (the plane) would have an angular diameter of 39.2 arcseconds. For reference, the planet Saturn's angular diameter varies between 14.5 and 20.1 arcseconds. When Saturn is in the sky at night, is it visible from the ground? Can it's rings be seen? Why do you say that if the object is "bare metal" that it would be brighter than if it were painted? What metal are we talking about here? Certainly if it were bare iron or lead it wouldn't be brighter than an object with a glossy white coat of paint. How reflective really are solar panels? Now, I realize that the Sun is so bright that any object, even the darkest absorptive black material, would still be extremely luminescent if it were bathed in the Sun's rays in space, but it would seem that a solar panel isn't too different from that example. I personally cannot ever remember seeing the reflection of the Sun off a solar panel, and it would seem by design that they must be as absorptive of sunlight as possible. I am not saying that were a solar panel in space that it wouldn't visibly reflect the Sun's light. I am saying that of all possible materials a solar panel would be amongst the least reflective. Yet, when there is reference to the ISS or another supposed satellite being a bright spot in the sky there is often particular emphasis on the solar panels as being the main source of that light, but to be logically consistent the other materials of the object would have to be the most reflective and the solar panels should be noticeably dimmer if one looked closely at this object through a telescope. I mean, ie, the shiny, silvery metal of aircraft aluminum (or aluminium as they say in the UK) that reflects all visibile wavelengths. It (the 747-8 plane) would be brighter in the way a signalling mirror is going to be brighter than a mirror painted over with glossy paint. The_White_Lodge » November 4th, 2017, 8:41 pm wrote: How reflective really are solar panels? I don't know for sure that those appendages on the "ISS" are really solar panels or if they are something else. As far as solar panel reflectivity goes, most of the ones I've seen are pretty glossy (bare silicon cells are around 30% reflective). The panels on the "ISS" are said to be foldable arrays as opposed to hard flat panels, so there would be the silicon reflectivity along with whatever the reflectivity is of the "array blanket" material. They could be solar arrays, but I don't know that they are. To be clear, the only part of the "narrative" I am willing to accept as true is that there is something up there at ~400 km and that it has the dimensions of the "ISS" we are shown in pictures. The only reason I think this is because it is relatively simple to verify through observation as many amateur astronomers have apparently done (and I, myself, am soon going to do), along with the fact that none of it requires any impossible physics. Beyond that - everything else the "official" story contains about what it actually is, what it weighs, what it does, what it's constituent parts are, what's inside of it - is unverifiable and should be regarded as a lie (as much of it is proven to be). Thank you for specifying. Given any type of solar panel then attached as to an object, if the body of the object is made of aluminum or something as reflective then would you agree that the metal exterior of the object should be the much brighter component of the object? Thanks! Anyway, I've been checking Heavens Above for passes over mi location, and it turns out that 400-some kms. is, quite logically, the minimal distance, when the object is exactly overflying the observer. But the distance when setting over the horizon is 2.300 kms. And it should be still visible! So, can anyone one imagine spotting a 747 from 2.300 kms. away? Ok, let's concede that it could be a highly reflective object and it would be easier to see against the dark firmament, but still looks pretty incredible. The_White_Lodge » November 5th, 2017, 7:33 am wrote: Given any type of solar panel then attached as to an object, if the body of the object is made of aluminum or something as reflective then would you agree that the metal exterior of the object should be the much brighter component of the object? The degree to which the panels can be seen seems to arise from the reflective/translucent properties of the grid material that holds the cells together in the array rather than the individual cells themselves. Again, this is only assuming that the panels really are solar arrays as opposed to just another appendage added for the purpose of making the artificial shape more discernible to observers on the ground, as could be the case. Altair » November 5th, 2017, 11:15 am wrote: But the distance when setting over the horizon is 2.300 kms. And it should be still visible! So, can anyone one imagine spotting a 747 from 2.300 kms. away? Ok, let's concede that it could be a highly reflective object and it would be easier to see against the dark firmament, but still looks pretty incredible. You generally won't see anything, except the sun and maybe the moon, right on the horizon due to atmospheric extinction. That's why heavens Above (and other sites) give 10 degrees above the horizon as the point at which it is considered observable. This is around 1440 km away and the math for the 76 meter long 747 plane is the same and works out to 10.9 arcseconds angular diameter. - this is roughly the current size of Venus. Even if you do the math for 2800 km away it still comes to 5.6 arcseconds, which is larger than Mars' current angular diameter. The reason you don't see 747's from that far away is because their cruising altitude puts them less than 10 degrees above the horizon once they're ~50 km away. I don't mean to be rude, but to anyone on the Internet saying they are about to produce evidence the ISS does or does not resemble NASA's color-changing CGI creation, rather than a sphere or some other light emitting object as it's been suggested before, I would like to ask that such evidence is accompanied by very strong indication that it is trustworthy evidence. That is, I hope the exact set up of the arrangement is documented — including pictures of the equipment and so on. Reasonable detail about the viewing location, conditions, and so on. The budget for NASA's hoaxes has apparently been diverted somewhat to the ISS in recent years, even though the shuttle magic trick may no longer be in operation in the United States. I say this because Google has now released that map feature where zooming out to maximum zoom on a conventional aerial map (they call "satellite" view with straight faces) now produces the option to click on various NASA image compilations, including a "location" called ISS. I suggest checking it out and seeing how their latest image compositing technology is going. Does anyone else think this looks a bit too conveniently like the hot dog shape of the inside of a jet? And what is with this door "to space"? Are we seriously meant to believe this? Should we use Google's quiet "Report a problem" link? Also gotta love the labels on that "control panel". I suppose the Americans operate the top part of the panel and Russians operate the lower part? So Russians get the cool blue spigot knob, and Americans get switches? Figures! NotRappaport » November 5th, 2017, 10:11 pm wrote: You generally won't see anything, except the sun and maybe the moon, right on the horizon due to atmospheric extinction. That's why heavens Above (and other sites) give 10 degrees above the horizon as the point at which it is considered observable. This is around 1440 km away and the math for the 76 meter long 747 plane is the same and works out to 10.9 arcseconds angular diameter. - this is roughly the current size of Venus. Even if you do the math for 2800 km away it still comes to 5.6 arcseconds, which is larger than Mars' current angular diameter. I'm comparing with the 747 just for illustration, I don't mean the plane should be where it's meant to fly. Just think that you put our Jumbo in the same orbit as the ISS. Also, it's not fair to compare an irregularly shaped tube with a sphere. In optimal conditions, Venus is almost 100% illuminated, and the same for Mars, so even when the angular diameter is roughly the same, it's magnitude should be way lower (higher, to be exact). In fact, on 14th this month I have a good pass over my location, and the ISS will set almost exactly by the point where an almost full Venus is rising some minutes earlier than the Sun, so it will be a good chance to compare - if it's not cloudy. BTW, I was goint to cite my own post about Spanish 'astronaut' Pedro Duque (viewtopic.php?f=23&t=720&p=2402835&hilit=duque#p2402835) but I've just found that the vids have been removed from YouTube. In fact, the account has been deleted. A pity, because that was utterly ridiculous. 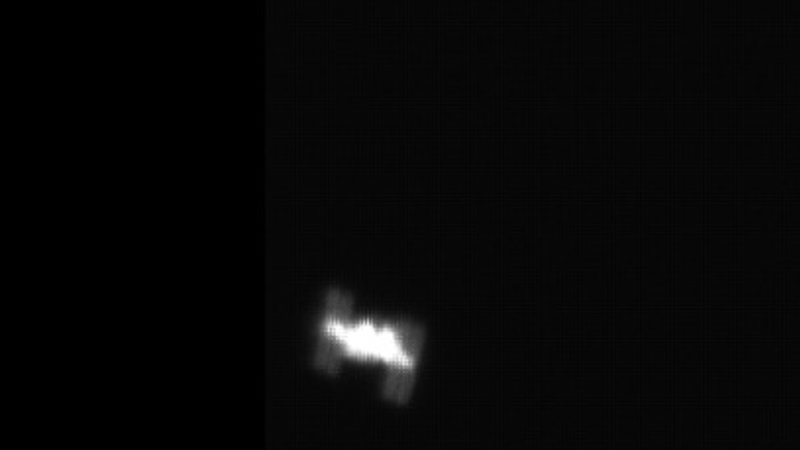 hoi.polloi » November 5th, 2017, 5:56 pm wrote: I don't mean to be rude, but to anyone on the Internet saying they are about to produce evidence the ISS does or does not resemble NASA's color-changing CGI creation, rather than a sphere or some other light emitting object as it's been suggested before, I would like to ask that such evidence is accompanied by very strong indication that it is trustworthy evidence. Since no one else in this thread is attempting to get a magnified look at the thing to test their ideas about what the "ISS" really looks like, I suppose this is directed toward me. Firstly, let me point out I don't know what the pictures I take will show as I have never taken pictures like this before. I suspect they will show something somewhat similar to other amateur pictures, only probably nowhere near as good since I'm doing this on the cheap. Cheap telescope (Meade Infinity 102) and (relatively) cheap DSLR camera (Canon Rebel T5). I'm going to find out firsthand how difficult (or not) it is to get a picture of it that resolves more than a point of light in the sky. 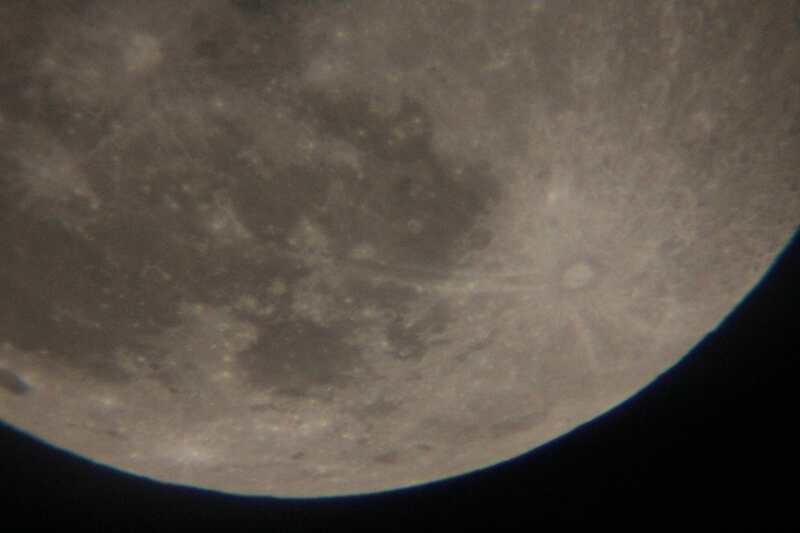 The last two evenings have been clear so I've been trying out the telescope setup to see how pictures come out when photographing something simple - the moon. From my tests thus far I've found that the (nearly) full moon, despite how bright it is at lower magnifications, at 66x magnification requires a really high ISO to shoot when using a 1/2000 shutter speed. In fact I had to crank the ISO all the way up to 6400 to get a reasonably clear picture that was still a bit dark. The view is of the Tycho crater. Incidentally, this looks like it would be the perfect camera setting to capture a lunar transit picture (the ones I've seen online use 1/1000 shutter speed and about this same magnification/resolution) but I don't know how long before one of those will happen near me. The magnification will suffice but I don't know if these exposure settings will work to capture the "ISS" against a dark sky background. I won't know until I get a chance to test it, and I'm waiting for a day when the "ISS" will be particularly bright. Coming up on November 16 it will be visible at magnitude -3.9, and also pass almost directly overhead here in the Bay Area, California - this is the point where I will try to get video (using the above settings and magnification) of it. The reason I am going to get video instead of a still picture is 1) my camera does not offer mirror-lock and I don't have a cable shutter release, so there is potential "jitter" from mirror-slap, and 2) trying to take a picture during the exact fraction of a second it will pass would be difficult and way too nerve-wracking. And it may end up being a bust. It might be a cloudy morning. I might not get the scope aimed right - not only is 0.25° a very narrow field of view (the apparent position of the stars changes by this much every minute), but the manual controls on my refractor are a bit stiff. Either of these would require waiting for another good flyby opportunity. Or the picture could turn out completely underexposed and not show anything but black, in which case I will have to not only wait till next time, but also try a lower magnification and/or a slower shutter speed, or just wait for a lunar transit which I know the settings above would work for. But if I get images that show anything - whatever it shows, even if it shows what I didn't think it would show - I'll post it. Dear NotRap, I think what Altair is wondering about is worth considering. Let's do a little thought experiment: Imagine yourself spotting a 747 flying overhead your garden one sunny afternoon - at about standard cruising altitude (ca. 10 km), moving from West to East (the plane, as it proceeds Eastwards, is therefore well lit by the sun from behind). As it moves away from you, the plane obviously becomes smaller and smaller. The cruise speed of a Boeing 747 is about 900 km/h. Now, imagine if (by magic) this 747 were capable of ascending to about 400 km of altitude. Well, let's say that (after having passed overhead of you in your garden) it starts slowly ascending and, 1440 km later, it finally reaches 400 km of altitude. The question is : do you truly / honestly think that, even given the most ideal of visibility conditions imaginable (i.e. super-clear sky / sun shining directly on the ascending shape of the large 747 wings), the plane would still be visible to your naked eyes, 1.6 hours after it passed over your garden? NotRappaport, don't worry, I am glad to promote and encourage any legitimate researcher's efforts! I hope you don't mind me commenting, with true respect for your art form, that there is a lot of distortion in your moon image. If the conditions of the atmosphere cause those enormous waves, I suppose the tiny ISS will appear like a blurry hologram under an ocean of wavy air. I definitely look forward to evidence, but we should not give our hopes up that the video can be accepted without analysis of what we're looking at. That should be a fun part, and I wish you luck! Perhaps you will be an inspiration for others to do research, too. As it stands, this level of resolution looks like the kind on grainy things I was developing in college photography courses. I don't think I was using zoom lenses like yours. I sincerely hope it will produce enough detail! Do you think there may be more ideal equipment one could borrow or rent for this kind of project? Maybe you can get up to Mount Shasta or somewhere for a clearer view?